Posted in: Presentations. Tagged: Dam, Electromechanical Engineering, Energy, Engineering, Extreme Engineering, Fluid Mechanics, Hydropower, Mechanical Engineering, Power Generation, Presentation, Water. A while back, I wrote a brief article on the pros and cons of alternative energy where I covered various forms from solar to wind. In this article, I will be covering my favorite form of power production: Hydropower! After quickly visiting the Hoover Dam in Nevada, the Washington Water Power Station in Spokane, and taking a tour of the McNary Dam in Oregon, my interest in generating electricity from moving water was rekindled. Many people flock to these large facilities for their grand views and powerful waters but may not know about the actual power production method. 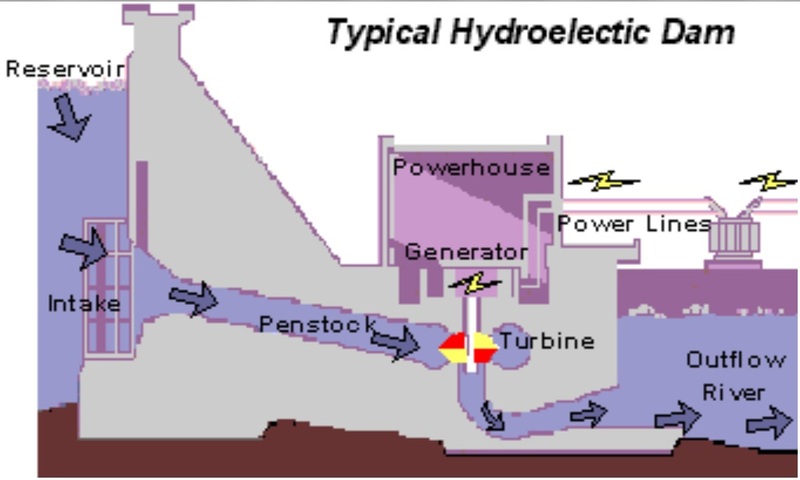 Hydroelectric plants produce power in a very similar way to other common methods such as coal-fired power plants. Regardless of power source, rotation of a turbine turns a generators shaft producing electricity for us to use. Instead of using steam to turn a vapor turbine, hydroelectric plants uses the energy from flowing or falling water to turn a turbine. 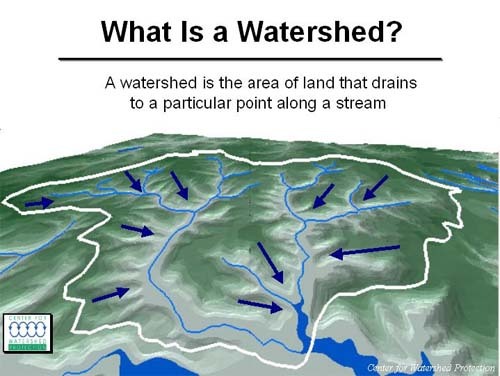 The root idea is to find a location with a large watershed area (where a lot of rain and snow falls). This also happens to be where rivers flow. If a lot of reliable water falls in an area, a lot of reliable energy can be produced. Another consideration for finding the most ideal place for a plant is river elevation drop. This gives power designers usable “head” or pressure created by the difference in elevation. After a location is found, designers will have to match the power produced by the plant with the power consumed by the consumers (me and you). Once they have the load demand for a typical day, they can calculate the flow needed to the turbines to meet that demand. Having numbers for head and flow are the two most important factors for designing a hydropower plant. Next, a dam, or structure to hold back water, helps to create a volume of water that will be fed to the power stations turbines. The dam has to be designed to create a sufficient reservoir with low risk of emptying. Low head or an empty reservoir means no electricity to match the needs of the consumer. Once a dam has been built and water has filled the reservoir behind it (which can take some time), a power plant can produce electricity. An intake brings water through a penstock (a large supply pipe) to the turbines. The best part of hydropower is that it incorporates the most efficient conversion of energy: work to work. 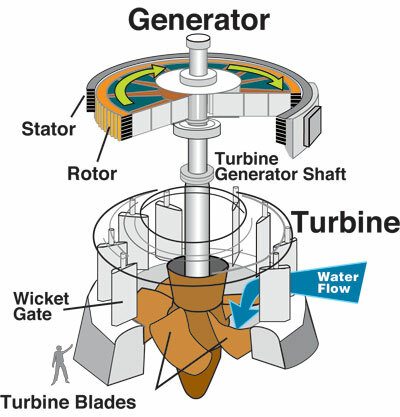 Flowing water turns a turbine which rotates a generators shaft. This produces electricity that is sent out to an electrical grid. The water’s energy has been converted and is sent away through a draft tube to continue on the rivers course. Electricity from the generator isn’t automatically ready to be used. It is often times upwards of 400V and needs to be stepped up to travel long distances. A transformer steps up the electricity to upwards of 110kV (110,000V) to limit the amount of losses incurred traveling thousands of miles to consumers. When the electricity reaches its consumers, it is then stepped down to safe usable levels such as 110V to 120V for home use. As you can see, there is a lot of engineering behind hydropower plants and I hope I have given you all a bit of insight as to how they work. There are a ton of dams across the U.S but not many in Kansas or Florida for their relatively flat terrain. In fact, there are 80,000 unpowered dams in the United States which could provide gigawatts (billions of watts!) of electricity. There are many different forms of hydropower plants in existence with the described one above being a single style. There are run of the river dams too which don’t have any reservoir and rely on the high flow of the river more than the head of a dam.